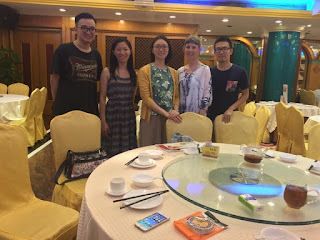 HHH faculty Yingling Fan and Sherry Gray had the opportunity to meet Humphrey School alumni in Shenzhen, China in May. Pictured here are Chendong Pi (MPP), Xiaodan Deng (MPP), and Xinyu Wu (MURP). All are recent HHH graduates pursuing successful careers in Shenzhen (Chendong and Xinyu) or Guangzhou (Xiaodan, many at HHH know her as Denise).